Vizier to the Egyptian califs Al-Mu'izz and 'Abd al-Manṣur; lived in the second half of the tenth century. The Chronicle of Ahimaaz ben Paltiel, the only source for the history of this personage, makes Paltiel, by his mother, Kassia, a grandson of Ḥisdai bẹn Hananeel and a descendant of the liturgical poet Shephatiah of Oria. When Oria was taken by Al-Mu'izz, Paltiel won the favor of the conqueror through his astrological skill. He predicted that Al-Mu'izz would reign over three countries. On leaving Italy Al-Mu'izz took Paltiel with him to his kingdom of North Africa and entrustedhim with the direction of the affairs of state. Soon the vizier had an opportunity to show his great administrative ability. During Al-Mu'izz's march through the desert against Egypt, Paltiel provided his army and retinue with all the necessaries of life. 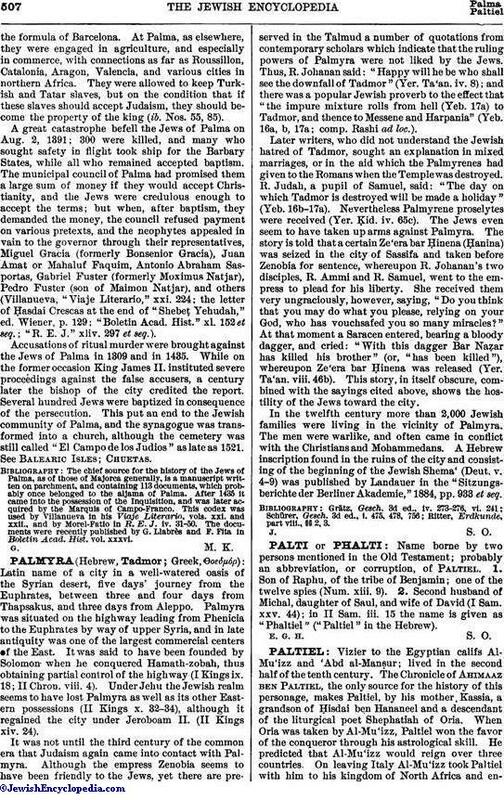 Ahimaaz expatiates upon the wise administration and the far-reaching influence of Paltiel, who, by a letter addressed to the Byzantine emperor, caused the release of the Jewish prisoners taken at Bari and Otranto. As an illustration of his generosity and modesty Ahimaaz relates the following: On the Day of Atonement Paltiel was called to the Torah. The whole congregation rose in his honor, but he bade all but the children to remain seated, announcing that otherwise he would not accept the office. When the reading was over he offered 5,000 dinars for various charitable purposes, including aid to the poor of Jerusalem and to the college at Babylon. Next morning he summoned a band of riders on horses and mules and despatched them, laden with the gold he had vowed, with a caravan. At his death his son Samuel, who succeeded him in the office of vizier, distributed 20,000 drachmas in similar benefactions. 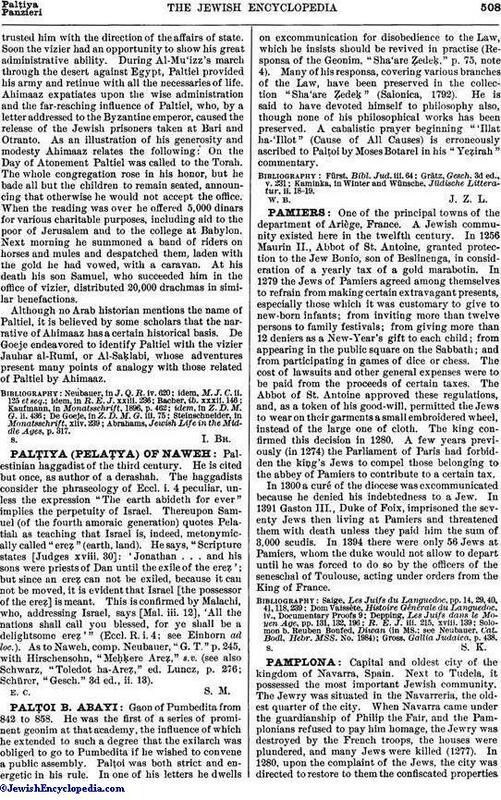 Although no Arab historian mentions the name of Paltiel, it is believed by some scholars that the narrative of Ahimaaz has a certain historical basis. De Goeje endeavored to identify Paltiel with the vizier Jauhar al-Rumi, or Al-Saḳlabi, whose adventures present many points of analogy with those related of Paltiel by Ahimaaz. Abrahams, Jewish Life in the Middle Ages, p. 317.